Focaccia style lagana is based on the Greek flatbread but with the addition of olives and sundried tomatoes mixed in the dough. Αncient Greeks colonized Southern Italy and Sicily between 800 to 500 b.C. and then in 146 b.C. the Romans conquered Greece. During these years the Romans were influenced by the Greek civilization, culture and among other things food. Until today in some parts of Southern Italy they still speak a Greek ancient dialect called “Griko”and the word lagana is still used there, however, having the meaning of wide tagliatelle. Lasagna comes from this word. Originally it was an unleavened bread but eventually some yeast was added. I know that now this is not the time for lagana, as traditionally this wonderful bread is only baked once a year, on the first day of Lent of the Orthodox Easter, and I cannot understand why, as everybody is crazy about this bread. As I said yesterday, when I made koulouria, I had made double the recipe as with the remaining dough I wanted to make one of our favourite flatbreads: Lagana but this time I decided to try something similar to focaccia. I remembered seing some recipes of focaccia and one was with sun dried tomatoes and green olives. The last time I went to the supermarket I had bought some sun dried tomatoes for another recipe and still had some left. I did not have green olives but I still have lots of throubes olives, which were perfect when I made the Eliopsomo (Olive bread). 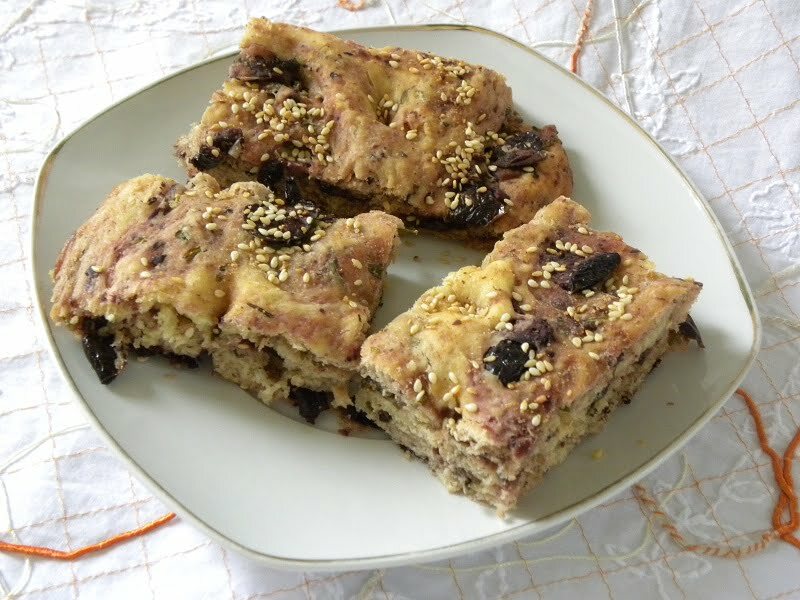 This focaccia style lagana is delicious when eaten warm but as I baked quite a lot, we ate the last piece today (five days later) and every day it was even better. It dried and was crispy (not hard) like a rusk with all those beautiful flavours in it. It’s Green Monday today and it’s been raining all day here in Assini, so we ate inside. I made all the preparation from yesterday, so I left the dough in the fridge overnight and baked them in the morning. If you want to prepare and bake them on the same day, you will need to bake them after the dough rises. You can prepare the dough using a stand mixer or by hand. I made the dough with 1 kio flour and after dividing it into two pieces, I made the classic lagana first. In the second piece of dough, I added some pitted olives, 2 spring onions with part of the green leaves, some sun-dried tomatoes and rosemary. Brush the flatbreads with olive oil, cover with cling film and then a tea towel and set aside to rise. Bake in a convection oven to 200 degrees Celciums for about 20 minutes. As soon as the top one starts browning, swap the baking trays. While preheating the oven, I added a baking tin filled with water to boil and make steam. I left it inside until the flatbreads were baked. In the picture you can see the reflection of the baking trays covered with tea towels, while rising. They were perfect with a delicious crunchy crust and their texture are light and airy. The first one can be eaten as regular bread or even sandwiched. The second one can accompany a meal but also eaten as a snack! Greek Orthdox Lenten Recipes are mostly vegan. If you think that during Lent, food is bland and boring, think again. I have prepared a roundup of more than 100 recipes for you to choose. A different "lagana" made with olives, sundried tomatoes, onion rosemary, etc. Taramosalata, is a wonderful Greek dip made with red or white fish roe of the cod or carp fish, served as an appetizer. Gigantes plaki is a deliciously hearty vegetarian dish made with giant beans, cooked in a tomato sauce, served as a main dish or an appetizer. Disslove the yeast with about 1/4 cup lukewarm water. Add sugar and some flour to make a thick batter. Cover with cling film and a towel and set aside until it bubbles. Attach the dough hook on your stand mixer and add the remaining flour, salt and olive oil in the bowl and mix. Add the yeast mixture and mix on low speed. Gradually add the remaining lukewarm water (as well as the orange juice) and knead until the dough forms into a ball which does not stick to your hands. If it sticks, add more flour. Add the filling ingredients to the dough and knead again for a few minutes. If the olives do not incorporate in the dough, knead it by hand. Cover with cling film and a tea towel and set aside to rise and double in volume. (You can also leave it in the fridge overnight. In this case bring to room temperature and knead again). Grease a big baking tray with olive oil and also grease your hands with olive oil. Press and spread the mixture to become one flatbread, not thicker than 2 cm. Sprinkle some sesame seeds, cover with the towel and set aside to rise. Bake in a preheated oven to 200 degrees C until crispy and golden brown, for about about 20 – 25 minutes, depending on your oven. The amount of dough made one classic lagana without filling and one with the filling. If you are making the first option with throubes olives, in the dough, you can add some orange juice to substitute part of the water. Hi Pixen. By all means you can do the kneading in your machine, just use the hook but believe me it’s not necessary as no much kneading is involved. wow! its looking so good! Another one of my favourites Ivy…I wish I could pop on over and indulge in that beautiful lagana! Love how used olives in the recipe too. Thanks Peter. So many things you can make with Kalamata olives. This really looks SO good Ivy!! I always love a bread that keeps well for several days. These look just beautiful!